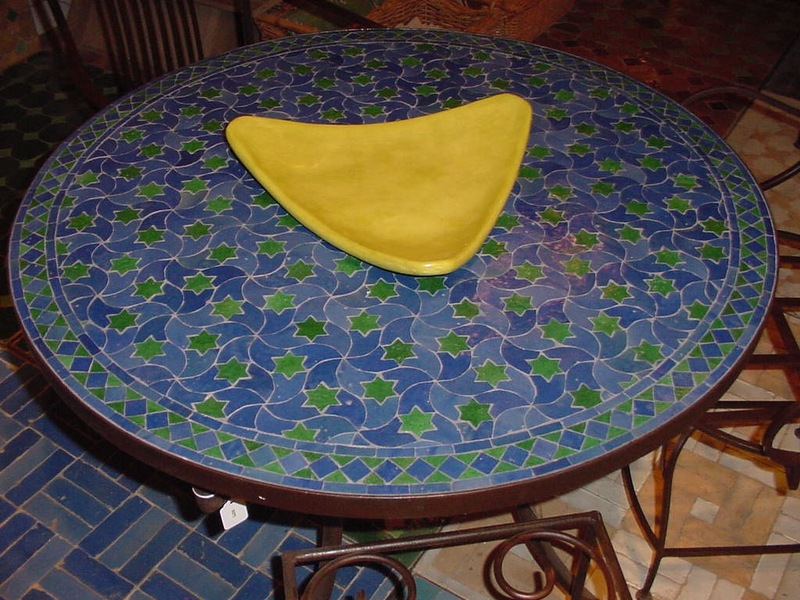 Our in stock mosaic tables with bases are readily available, and can be shipped nationally. Our inventory is constantly changing. Please contact us about availability or if you would like a quote on customizing your own mosaic table. Our mosaic tiled tables can be customized in color, pattern and can be varied to your desired specification. We also make metal bases for the tables. So you customize the height. Our intricate mosaic tile is an authentic work of decorative art. Mosaics are small tiles or fragments of tiles that are used to create a specified pattern. This process is referred to as “zelij” in North Africa. Our talented artisans begin this intricate process by hand-cutting the 4″x4″ hand-painted square tiles into the the desired shape. Similar to a puzzle, each piece of mosaic is placed face down to create the ornate mosaic pattern. Due to the variance of chiseled pieces expect beautiful variance in color tones.